We are part of the PPG/CAP Certified ApplicatorSM Program. This select nationwide network of exceptional coating applicators whose facilities and quality control processes are rigorously audited by PPG to deliver the highest possible level of product quality, customer service and technical expertise. We control every step in the manufacturing process of all our finishes under one roof. To ensure the quality and the integrity of the aluminum alloy we cast our own aluminum logs for extrusion at our ISO 14001 certified facility located in Dublin, Georgia. These logs include a minimum of 30% pre-consumer recycled aluminum content. What is Anodized Plus®? It is more innovation from YKK AP. Anodized Plus provides a unique protective seal on anodic finishes. Its anodic coating combined with an organic seal offers the dual benefits of enhanced durability and resistance to staining and degradation. Conventional anodic coatings rely on hot water or steam sealing to close the porous anodic layer; however, it is not possible to close every pore using this process. YKK AP Anodized Plus replaces the conventional sealing process with a unique non-aqueous, electrodeposited organic seal that provides complete protection for the anodic oxide and the pigmentation coating. 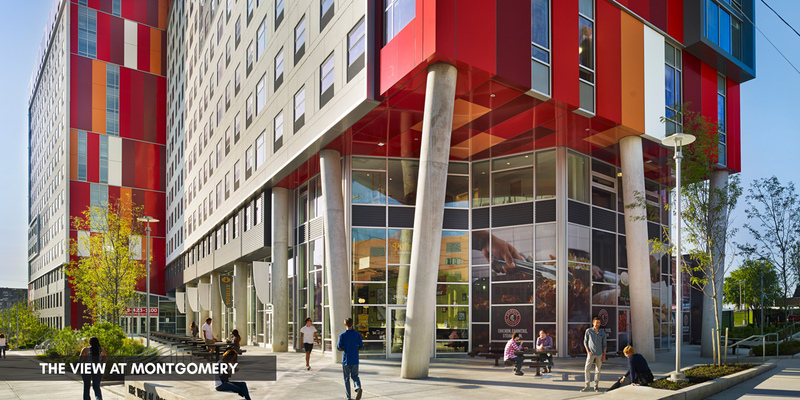 The redevelopment of the 4.5-acre Wanamaker Middle School site at 11th Street and Cecil B. Moore Avenue in Philadelphia is evolving into a mixed-use, privately owned student housing development for 2,500 student residents. 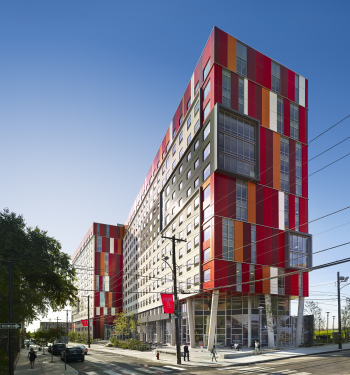 YKK AP enerGfacade products were chosen by architects for their energy efficient properties.